If you’re just joining, our family of four is on a three-year journey to double our net worth and become location independent. Since we’ve achieved the latter goal, we’ll be primarily focused on the former in each of these reports going forward. 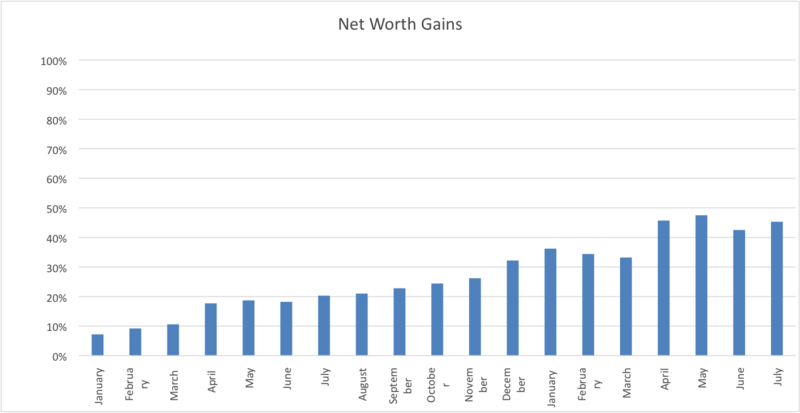 Each month, I record our progress on our net worth and our spending. Last year, we increased our net worth by 32% over the year before. This year, we’re trying to increase it by more than 65% from where we started in December 2016. Given our move and the market, I’m not sure it’s doable. But we’re going to try. We’ve reached part of our goal of The Three Year Experiment of location independence this month (woot woot!! ), but we haven’t yet reached our net worth goal. As of July 31st, our net worth has increased by a total of 45.3% from our starting point in December of 2016. We are almost at the level we were in May before we sold our house; that makes me feel good (thank you market). Since we’re no longer going to be dependent on our net worth to fund our location independence, it’s perhaps a less urgent goal than it was before. However, having seen the freedom that a certain level of financial independence has brought to our family, I’m more convinced than ever that increasing our net worth and becoming completely financially independent is the goal we should be focused on. 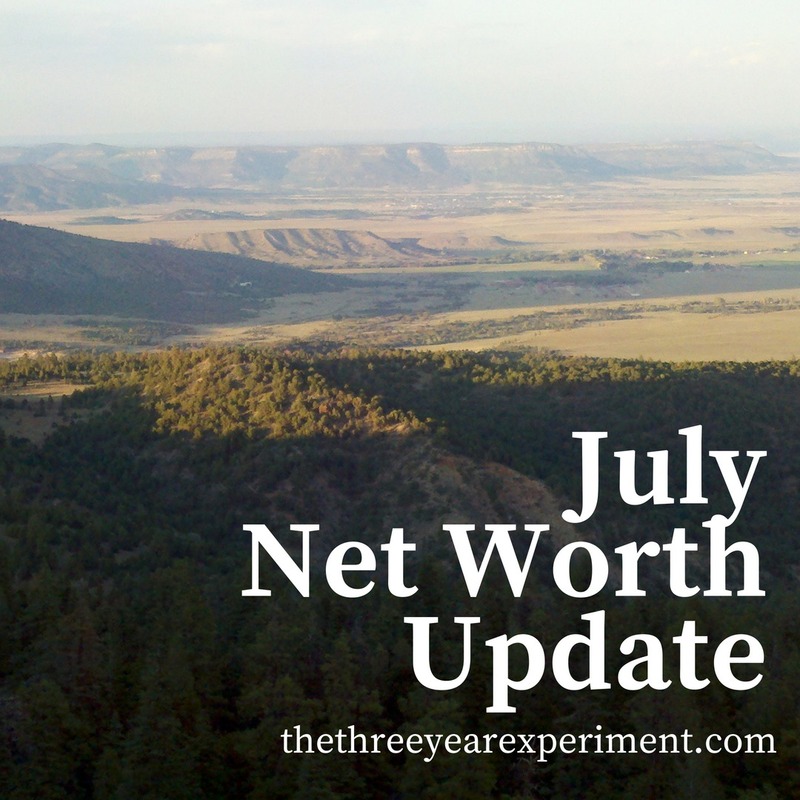 We’re taking steps this month to improve our budgeting (skip to the bottom of the post for more) so I’ll keep bringing you net worth updates in the hopes we can, going forward, increase our net worth by even larger percentages than we have been. This month, our spending report will look a little different. Because we’ve hit our location independent goal, the next big goal for us (some years hence) is retirement. I’m interested in looking at what our expenses will look like in retirement. So, I’m not including mortgage, because it will be paid off by retirement. I am including our healthcare costs, which are currently automatically taken out of Mr. ThreeYear’s paycheck, because I want to become more cognizant of what we actually spend on healthcare. That’s a big cost in retirement. I am including charity, because giving will be important for us in retirement. I’m going to keep breaking things down, but I’m also going to list a big overview in chart form. Charity: $500. We sponsor a child through Compassion International and gave the family a mid-year gift. We also helped some relatives. Tithe: $1550. This was for our NH church since we were leaving. Groceries: $938.99. As you can see, we blew through and over our grocery budget this month! It was very easy to do, unfortunately. We went to the store so many times to fill up our empty fridge. It was so hot and we bought drinks and ice cream, and we had family over to eat. I’ll be delving into more details in my “Year of Good Food” post later this month. Eating Out: $551.75. I know, this number is ridiculous! We ate out on our trip down to North Carolina (expensive sushi place, we didn’t know), before we moved in to our new house (trying out local places), and then we had a big, fancy dinner at a local restaurant for my sister’s birthday. Entertainment: $48.13. This was for rental shoes at bowling, arcade money, ice cream, and a movie rental on iTunes. Fun Money: $98.29. What Mr. ThreeYear and I each spend on stuff for ourselves. Health insurance: $724.72 paid for by Mr. ThreeYear’s employer currently. Includes medical and dental coverage plus FSA reimbursement for our family of 4. Fitness: $0. I’m going to start including this category in health because it’s what we pay for our neighborhood pool, gym, and tennis courts. We haven’t paid anything yet. Housekeeper: $50. We paid a housekeeper to clean the beach house. Furniture: $178.25. We spent some money at IKEA outfitting Mr. ThreeYear’s office and picking up odds and ends for the house. Home maintenance: $2311.84. This was death by a thousand cuts, save for a new TV for the living room. Air conditioning repair man, paint for Junior ThreeYear’s room, a rug from Facebook Marketplace, hardware for a desk. Some of these costs should probably go in the “Furniture” category but I just threw most everything here. Camp: $311.90. Junior ThreeYear leaves for his first overnight camp at the end of August. It’s in New Hampshire, so this cost was a flight back to NH from NC. Lessons/Costs: $73.28. New glasses (3 pairs from EyeBuyDirect), Minecraft Realm subscription that’s part of Junior’s allowance, Starbucks. Gas: $259.08. In addition to driving from NH to NC, we drove to the beach and all over Charlotte this month. Maintenance: $73. One overpriced oil change. We’ve since gotten on NextDoor to figure out a cheaper option. Insurance: $321.26. Our six-month premium. Internet: $85.99. New, high-speed internet (up to 100 mbps) at our new house. This includes set-up costs. Future costs will be $45 per month. Subscriptions: $25. Home phone through Ooma, Spotify, Skype. Electric: $99.41. Our last bill from NH. Natural gas: $0. Haven’t gotten a bill yet in NC. Water & Sewer: $40.65. These are new costs that we haven’t had to pay in the past. Disney trip: $2739.37. As if we hadn’t spent enough this month, our final payment for our Disney trip we’re taking in September was due. This is the big trip we’re taking this year (not counting the trip to Chile we took in December/January), and the first time all three of my guys have ever been to Disney. We are excited! I will have a post on all the costs for this trip soon. Here it is again in a condensed table format. Holy cow. That is a lot of money. I am officially the spendiest money blogger in existence. How in the world have we been able to increase our net worth with expenses like this? First of all, this is a highly unusual month. I expect next month to clock in at around a third of this month’s total. Second, we had cash set aside to cover all of these costs. Third, we’ve worked hard to increase our incomes and keep spending on the big three (cars, house, food) low. So while we do spend more than MMM’s $24,000 a year (obviously), we save a healthy percentage of our incomes, a percentage that’s slowly increasing over the years as we pay things off. We use the budgeting software YNAB to manage our monthly budget. I’ve just finished reading the book and it’s excellent at explaining YNAB’s budgeting philosophy: budget using the money you currently have in your accounts. Don’t plan what you’re going to spend in the future; that’s forecasting, and you really can’t know what you’ll have or what your expenses will be until you’re there. So plan now, thinking long term, but using the dollars that you have available to you currently. One of the big rules for using YNAB is aging your money. That is, try to have money that sits in your bank account for a while before you use it, instead of spending it as soon as you get it. That’s why they recommend saving up a month’s worth of paychecks and using them to budget for next month, so you’re a month ahead. Easier said than done, my friends. In August, for the first month ever since using YNAB (over a year and a half), we’ll be one month ahead. This was because we didn’t have a mortgage payment in July (because you pay your mortgage at the end of the month) and because we reserved some money from the house sale for the inevitable expenses with the move. I am guarding that money like a hawk and determined to stay a month ahead from now on in YNAB. I know it’s not going to be easy, because there are so many expenses associated with our new house, but I’m going to work very hard at it and I’ll report how I’m doing. And yes, I could have transferred some money from our savings to get us one month ahead with YNAB, but that felt like cheating, and saving/investing was always a bigger priority. But now the stars aligned and we have a month’s income ready to budget for August (rubs hands together excitedly). We’re going to spend this month enjoying the last of our summer. 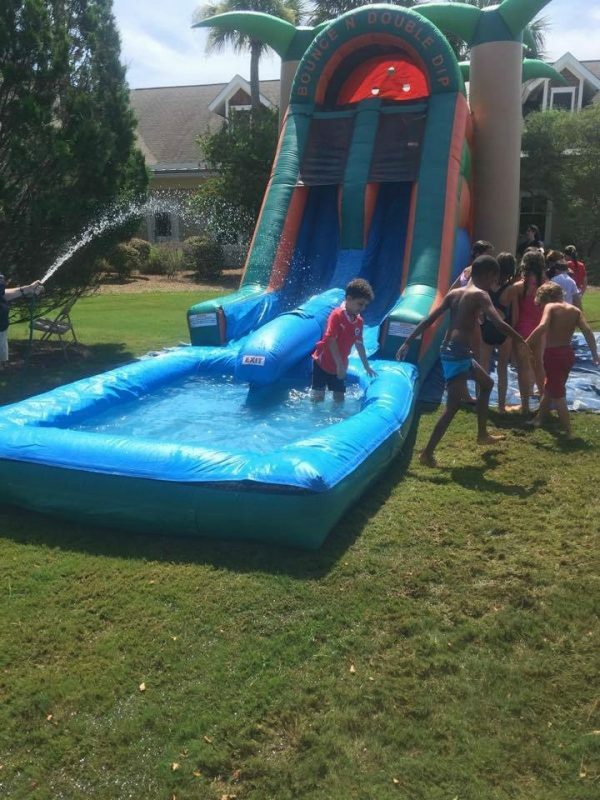 School starts for us on August 27th, so we have about four weeks left to enjoy the freedom of no routine, impromptu trips to the pool, and time at the beach. 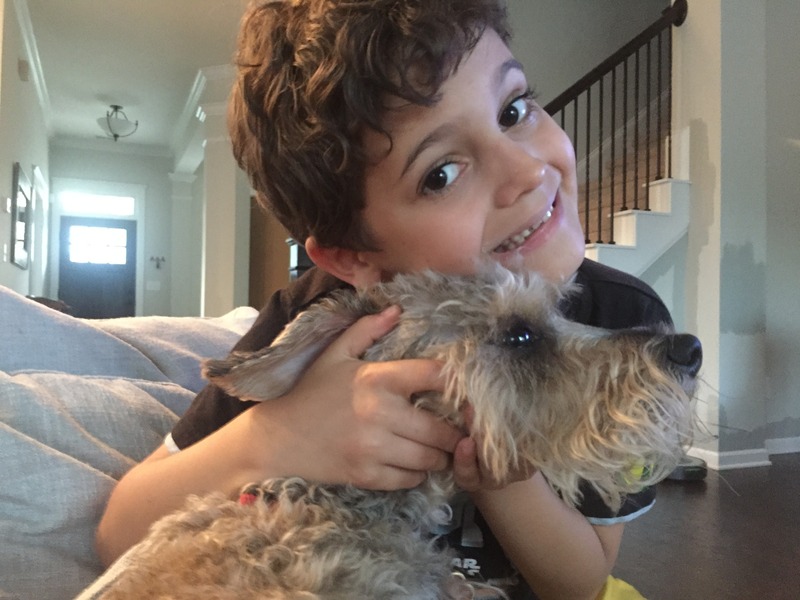 Little ThreeYear enjoying his dog cousin. Have a great month. I’m so grateful to you for following! Congratulations on hitting your “location independence” goal! What a huge accomplishment is such a short period. I love how you lay everything out on the table. Very transparent and helpful! I’m amazed at the amount of expenses you have. Moving is expensive and time consuming. ~$16.000 is close to the amount I’ve spent in 2018 in total. Good to see that your net worth is growing steadily in spite of this. holy underwear!? 15 thousand american dollars! that’s all i got. it will all settle down. getting your set-up right is expensive. I know, right?! 🙂 Yep, August has to be less expensive or I’m leaving! Haha. It was kind of crazy in July.